Well, I guess I'm going to have to post this pattern today because I keep getting this sent to my wall, messaged, and tagged to me on Facebook :D I actually did see this prior, via Pinterest and kind of skipped over it, but everyone else seems to really love it! You can easily turn your flip flops into crochet slippers! Basically, you just poke holes into the flip flop foam to create a border to crochet into. 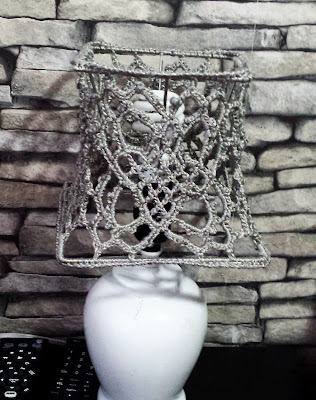 (I used a large curved upholstery needle) They are super cute, and the only reason that I had skipped over it, was because I have done it before and the result was great at first... but they didn't hold up. The foam ripped all of the way through in several places and created holes. Maybe I used a bad quality flip flop, maybe I was too rough on them, maybe, several maybe's... that being said, maybe I will have to try again and see what happens. They are pretty adorable, so it's worth it to give it a shot, and nice that someone has explained it out perfectly so you have a great guideline to go by, so good luck! I need a new belt, maybe I will make this one! I have a lot of crochet thread scraps that I could use to give it a cool color combination! The designer used two strands of crochet thread to achieve the firmness of this belt, but you could most likely use any yarn. I do like the idea of the thread though, it has a different feel. I can't wait to get some down time to try this out! I came across these while browsing Pinterest today and thought that they were so cute! There are SO many slipper patterns out there, so I get pretty excited when I see something different, like these cool double strapped crochet slippers. I like how the stripes work into the straps, very clever. If you're looking for a multi-way garment for the summer, check this out! A great crochet dress that doubles into a crochet skirt for the warm summer months, this versatile pattern uses light sport weight cotton yarn for a nice breathable style. 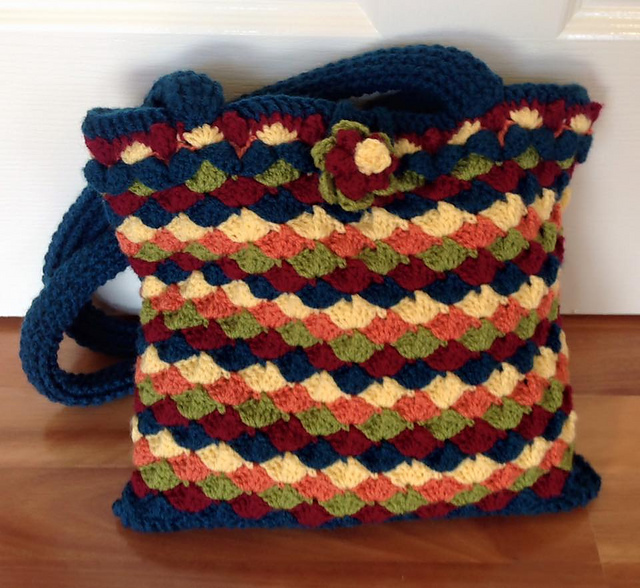 Are you ready to make a crochet bag? How about this one? It's beautiful, has interesting stitch work, gives you the ability to use multiple colors, AND includes charts and written instructions. The designer has written up this wonderful pattern, and teaches you how to read charts along the way. So neat! This is a great idea for a bathroom when space is limited; or just cool to have because you can easily custom this to your room. I have nothing left to say other than this is a very clever idea! 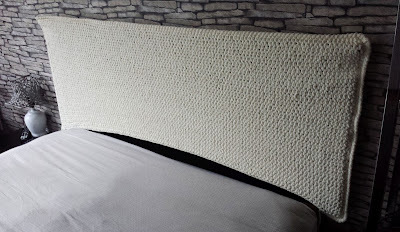 A Crochet Headboard - A look inside my bedroom! This is where I sleep. I'm inviting you into my personal space today because I want to show you my headboard! I'm so excited about this because my headboard is of course... crocheted. I gave my room a makeover a few months ago, and I'm still looking for some pieces to complete the look, like a cool chandelier, and some type of large artwork... I haven't found anything "perfect for me" yet, but it will come in time, I'm sure. My headboard used to be on that list. 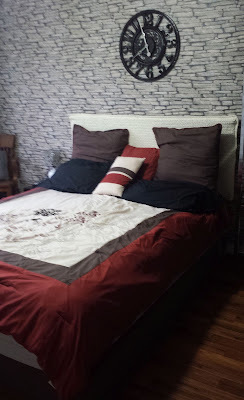 I originally wanted a big white upholstered headboard. I love the way they look, so classy, sophisticated and cozy. And they're really expensive! 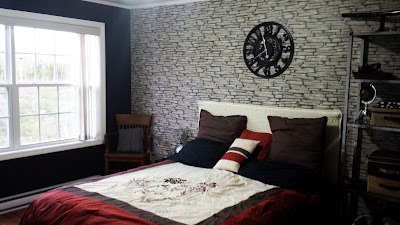 After already dropping a pile of $$$ on decorating the rest of my new house and developing my yard, a big lavish headboard was just not in my budget. And I'm cheap? 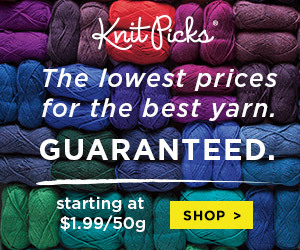 No.... not cheap, I prefer to save my money for fun and yarn (and landscaping)! Most of my home decor is second hand finds, that I either re-finish or things that I actually build myself, I love that sort of thing! Now back to the headboard! It is an ugly, pressed board, fake wood, with an ugly faux granite accent, queen sized headboard. It was given to me. Someone moved away and left it at someone's house, and that someone asked me if I wanted it, and I said yes! I've had it for a few years, and I was really tired of it. If I couldn't get rid of it and get a new one, I was going to give it a new life! So I made a crochet slipcover for my ugly headboard. Now I love it! 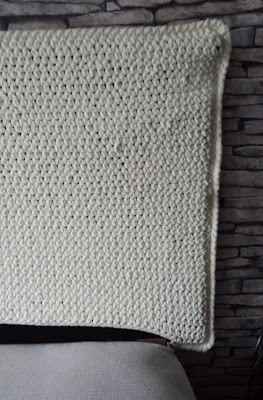 I used the Bernat Blanket yarn, the super bulky soft yarn in Vintage White. It's the perfect "off-white" color for my project. Rows 2-50: Hdc in each hdc. (112 hdc) Fasten off. Rnd 1: Place one panel on top of the other panel, begin at the bottom, starting about 4 inches in and along the bottom side, sc through both sides, and evenly work a sc at the end of each row (through both panels) along sides, and across the top, and down the other side, and under and over about another 4 inches (to match 1st side). Rnd 2: Ch 1, (working backwards) Work a Rsc (also known as crab st) through each sc around. Fasten off, weave in ends. I love how the crab stitch (I prefer to call it that) looks along the border of the headboard, it finishes it off nicely. If I wanted to get real fancy, I could add some studs or something, but I like it the way it is now. My room is already pretty busy with my feature wall, so the white headboard really gives it a pop of solid color and brightens up the room. If I ever get sick of it, I can just take the slip cover off and make another one, but let's hope that I love this one for a long time! Oh yeah, and it's easy to wash too! Now about sizing... what I did may not work for you! 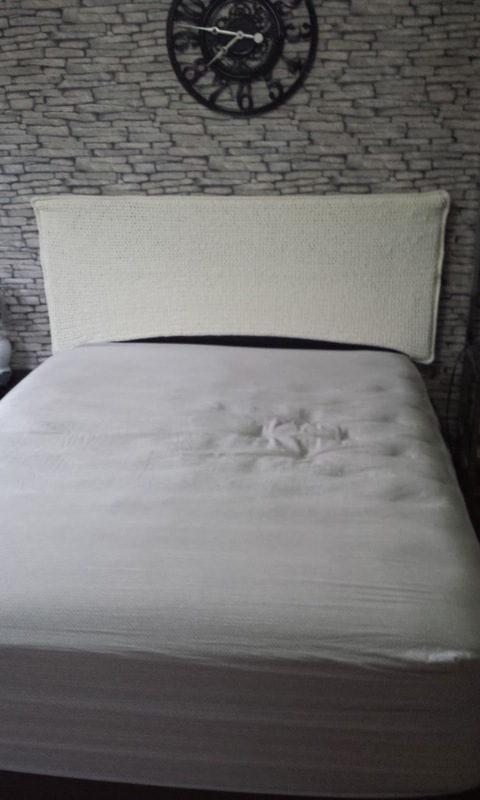 If you want to try your own, just remember that your headboard may be a different size and width. But that's not a big problem,just measure it. Remember that you will want the slip cover to stretch, you don't want any creases or bulkiness, so measure it, keeping stretch in mind. I actually had to crochet about 10 rows first, but only went halfway across my headboard and stretched it out as far as it would go. Once I got a a good count and gauge set, I multiplied my half by 2 and started from the beginning. I came out with 112 hdc across by 50 rows for each side. My headboard is about 2 inches wide. Overall, this took me only two days to complete, but I am admittedly OCD, I worked on it like mad woman! Would you crochet something like this?! 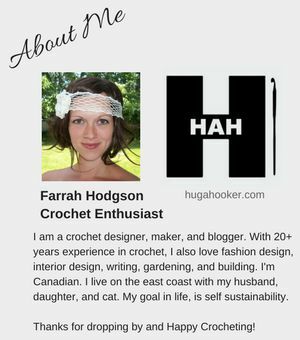 It's no secret that I love crochet jewelry! I've been having a hard time finding new patterns lately, until today! This wonderful crochet necklace uses the puff stitch, which adds a unique spin, along with beads and embellishments for appeal. This necklace is so pretty, and a great crochet thread stash buster! 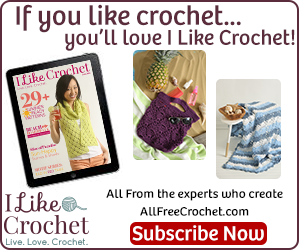 This pretty crochet dishcloth pattern comes right on time for me! I have a lot of cotton scrap yarn in my stash right now and would love to use it up, and here's a great project to do just that! I like making my own dish cloths and towels, besides the fact that I just love to crochet, but it's easy to customize anything to match or contrast your home! 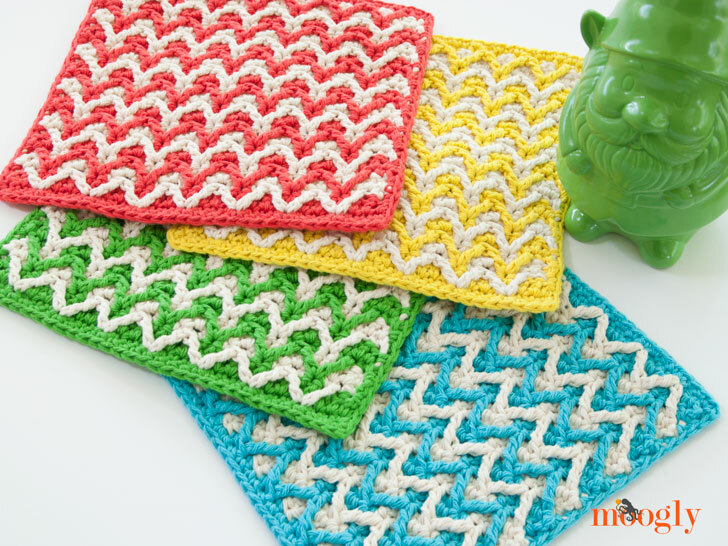 This chevron pattern is a nice new take on the ever popular crochet dishcloth! This pattern was a spontaneous idea that came to mind after buying this yarn. The yarn was meant for a different project, but I had decided not to do it, sooo.... I can't stand having a large ball of yarn in my stash with no plans for it. 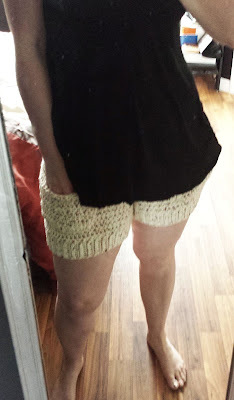 I have some ideas for crochet cotton shorts, which I was going to use a lighter weight cotton, but thought, "hey, I'm going to try these in the worsted weight." Normally I would have used a different color, I'm not real fan of this color blend, but I AM pretty happy with the design itself. It's very easy and it works up quick. 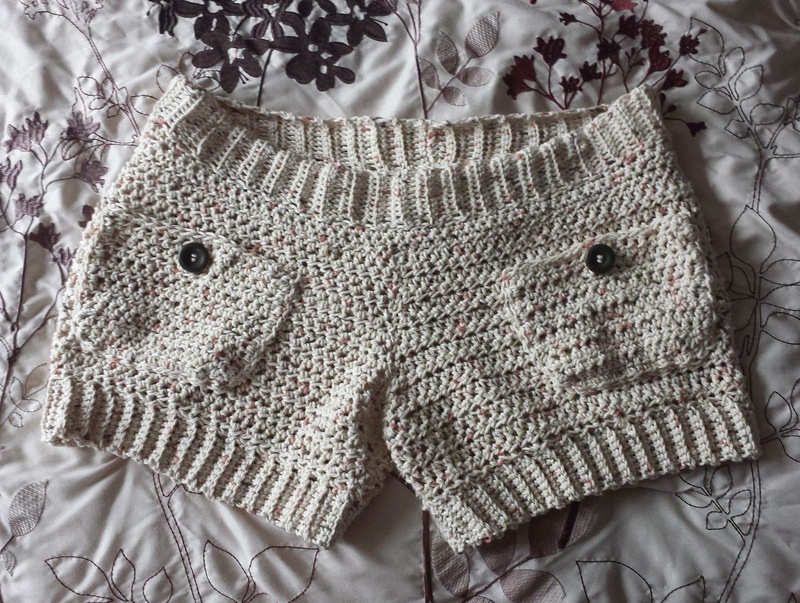 There's also so many ways to customize these shorts! You can easily make them shorter or longer, use multiple colors, stripes, add pockets or leave them without, or add even more pockets... it's up to you! I can't wait to see your projects. 1 big ball, Lily Sugar 'n Cream, 100% Cotton; 400g, 650 meters / 710 yards; color Sonoma Print. Fsc=Foundation Single Crochet: (Taken from Lion Brand) (Note: This method creates a base ch and a row of sc at the same time: easy, sturdy and elastic, especially useful for necklines and waistlines.) Start with a slip knot, ch 2, insert hook in 2nd ch from hook, draw up a loop, yo, draw through 1 loop, yo, and draw through 2 loops - 1 single crochet with its own chain at bottom. Work next stitch under loops of that chain. Insert hook under 2 loops at bottom of the previous stitch, draw up a loop, yo and draw through 1 loop, yo and draw through 2 loops. Repeat for length of foundation. Row 1: Ch2, hdc in 3rd st from hook, hdc in each next (35, 41, 47, 53, 59) sts. Rows 2 - (4, 4, 5, 6, 7): Ch 2, turn; hdc in next (36, 42, 48, 54, 60) sts. Row (5, 5, 6, 7, 8): Ch 2, turn; 2hdc in 1st st, hdc in next (34, 40, 46, 52, 58) sts, 2hdc in last st.
Row (6, 6, 7, 8, 9): Ch 2, turn; 2hdc in 1st st, hdc in next (36, 42, 48, 54, 60) sts, 2hdc in last st.
Row (7, 7, 8, 9, 10): Ch 2, turn; 2hdc in 1st st, hdc in next (38, 44, 50, 56, 62) sts, 2hdc in last st.
Row (8, 8, 9, 10, 11): Ch 2, turn; 2hdc in 1st st, hdc in next (40, 46, 52, 58, 64) sts, 2hdc in last st.
Row (9, 9, 10, 11, 12): Ch 2, turn; 2hdc in 1st st, hdc in next (42, 48, 54, 60, 66) sts, 2hdc in last st.
Row (10, 10, 11, 12, 13): Ch 2, turn; 2hdc in 1st st, hdc in next (44, 50, 56, 62, 68) sts, 2hdc in last st.
Row (11, 11, 12, 13, 14): Ch 2, turn; 2hdc in 1st st, hdc in next (46, 52, 58, 64, 70) sts, 2hdc in last st.
Row (12, 12, 13, 14, 15): Ch 2, turn; 2hdc in 1st st, hdc in next (48, 54, 60, 66, 72) sts, 2hdc in last st, fold over and sl st in 1st hdc to JOIN. (= 52, 58, 64, 70, 76 hdc) Do NOT fasten off. Rnds 1 - 5: Ch 2, turn; hdc in next (52, 58, 64, 70, 76) sts, sl st in 1st hdc to join. 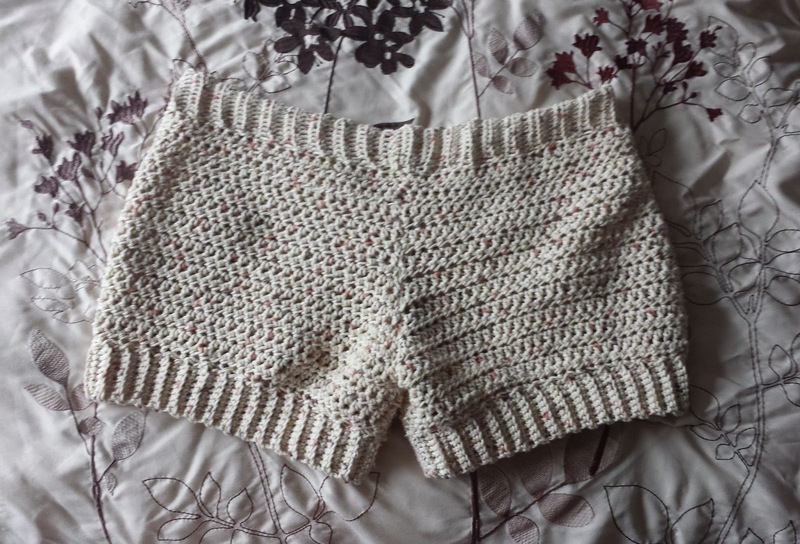 - working along the stitches of Leg Rnd 5 (Base Stitches), you will work short vertical rows. Row 1: Sc in 2nd ch from hook, sc in next 7 chs; skip next base st, sl st n next base st.
Row 2: Turn; skip over sl st; sc in next 8 sts. Row 3: Ch 1, turn; sc in next 8 sts, skip next base st, sl st in next base st.
Repeat Rows 2 and 3 around the entire leg. When you run out of base sts, fasten off, leaving a long tail for sewing. Sew last Row to Row 1. 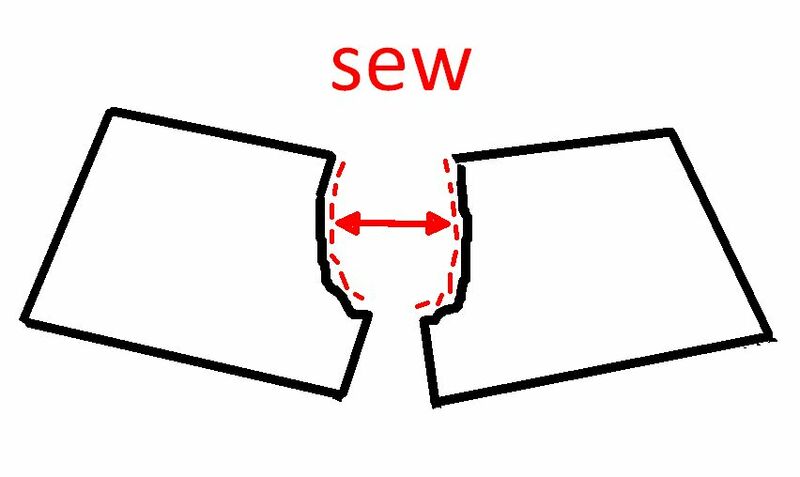 Now you are going to sew the two legs together, from the center top of rear (doesn't matter which side you choose at this point), downward and up to center top front. Right Side facing; attach yarn to top of back seam (doesn't matter which side you choose) with a sl st.
Rnd 1: Ch 2, hdc in next (20, 23, 26, 29, 32) sts, sc in next (32, 38, 44, 50, 56) sts, hdc in next (20, 23, 26, 29, 32) sts, sl st in 1st hdc to join. Rnds 2 and 3: Ch 2, turn; hdc in next (20, 23, 26, 29, 32) sts, sc in next (32, 38, 44, 50, 56) sts, hdc in next (20, 23, 26, 29, 32) sts, sl st in 1st hdc to join. Row 1: Sc in 2nd ch from hook, sc in next 9 chs, skip next base st, sl st in next base st.
Row 2: Turn; skip over sl st, sc in next 10 sts. Row 3: Ch 1, turn; sc in next 10 sts, skip next base st, sl st in next TWO base sts. Row 4: Turn, skip over 2 sl sts, sc in next 10 sts. Row 5: Ch 1, turn, sc in next 10 sts, skip next base st, sl st i next base st.
Repeat Rnds 2-5 around the base sts of the waist until you run out of base sts. Fasten off, leaving a long tail for sewing. Sew last Row to Row 1. Row 1: Sc in 2nd ch from hook, sc in next 15 sts. Rows 2-10: Ch 2, turn, hdc in next 16 sts. Row 11: Ch 1, turn; sc in next 16 sts. Border - evenly work sc sts down side of pocket, along bottom, and up opposite side. Fasten off, leaving a long tail fore sewing. 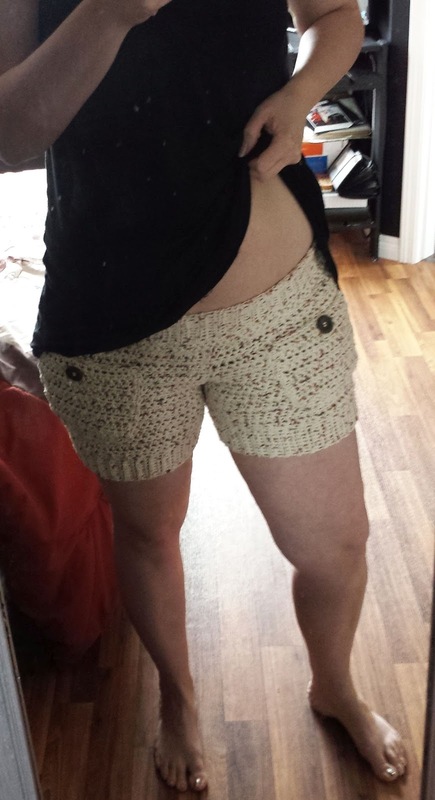 Pin pocket onto shorts, and sew into place. Make another. 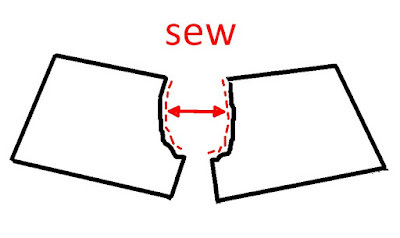 Optional: Sew buttons into place. This pattern has not been tested. I am human and capable of errors and typos. If you have any questions, feel free to contact me. You may make and sell the finished products from my patterns. You may share the link and/or main photos from my patterns via social media or your own personal blog. Sharing and copying of the written pattern is not allowed without consent from the designer (me). Copyright 365 Crochet, 2016. It's that time of year again... time for barefoot sandals! 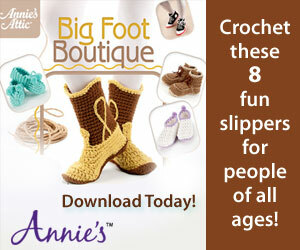 Crochet barefoot sandals are so fun to make, and there's no lack of free crochet patterns for these kind of foot decor. I love this particular design for the center flower design and the size. I find myself steering toward the bigger patterns these days. Go big or go home! And the center bead adds a bit more to this cute design.